The Cape May birding Big Sit took place on Sat 10 Oct 2015 at the Hawkwatch platform of the State Park. 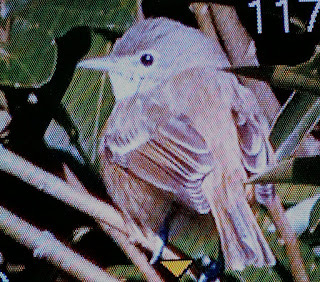 The object was for birders to see/hear as many birds possible from a single location in 24 hours. My first Big Sit. A little lazily I arrived in the dark at 05:30, it was cold and windy, and I wasn't sure if I was in the right place. Birders were clad in duvets and blankets to keep out the chilly wind and looking more like giant Yodas. Had I arrived at a Jedi Knight convention? I'm sure one of them said "12 am have been here we have. Approx 25 species have we heard. The force is strong (i.e a favourable NW wind)". Soon I was able to identify birders on call, and then the birds woke up around dawn. I did a stint up to 08:20 and tried to help where I could claiming Brent Goose, Arctic Skua and Gannet over the sea, but I could not help with identifying many of the flyover warblers on their reverse migration. Much respect to those who could and likewise to those souls who arrived at midnight for the start. It was nice to observe migrating Great Blue Herons and several American Bitterns in the early morning light, and connect with a variety of species as varied as Brent Geese, Eurasian and American Wigeons, Pine Siskin, Eastern Meadowlark and what seemed to be a precession of Dickcissels. Returned after a break at 09:30 continuing until 14:00. The list was building, but I regretted taking the 2nd break returning at 16:20 as a Golden Eagle was seen in that interim, more importantly it was on the list. I stayed until dusk having noted additions to my own list for the day throughout including for example in the final session, Northern Rough-winged and Barn Swallows and Lesser Black-backed Gull plus the 2 commoner Scoters. Also of note- Yellow-breasted Chat drew attention as did both American Coot and Common Gallinule (Moorhen). As dusk fell Common Nighthawks were in the sky and several American Bitterns flew out into the bay past the lighthouse. The wind kept with a northerly component throughout encouraging migration and the group's list totalled 149, 1 short of the record. (Presuming details to follow on local websites.). I reckon I observed about 60% of the species noted by the team. It was nice to take part. As Yoda would say, "Enjoyed the day, did I." Sun 11 Oct 2015- Spent the morning birding with Nick K, captain of the brilliant World Series of birding team - 1000birds. We saw the Common Nighthawk perched up near the car park at Higbees and the rare visitor, Bell's Vireo, on the edge of the first field. Moving on, we didn't find many migrants in checking out the State Park and the trees at CMBO Northwood, but a few raptors were overhead back at the State Park Hawkwatch platform including a 'Grey Ghost' - adult male Northern Harrier that joined a very high kettle of Turkey Vultures. Slow birding the rest of the day, hanging out at the Hawkwatch and checking the Point gardens for warbler activity. Only Yellow-rumped Warblers on show, bucket fulls of them, but noteworthy at CMBO Northwood were a late-ish Blue-headed Vireo foraging in the same tree as a Ruby-crowned Kinglet with a White-throated Sparrow feeding in the leaf litter below. 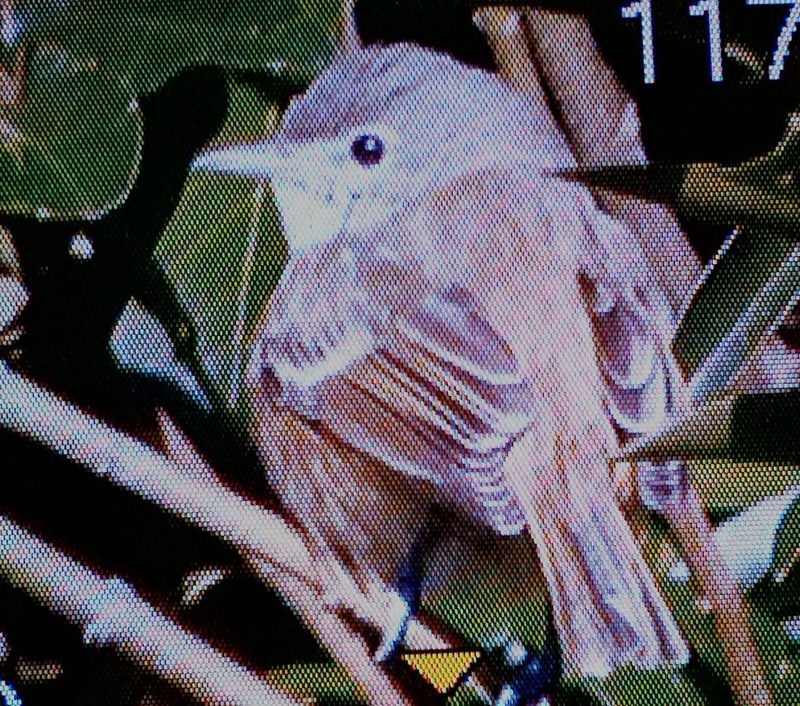 Back of the camera photo of the Bell's Vireo.